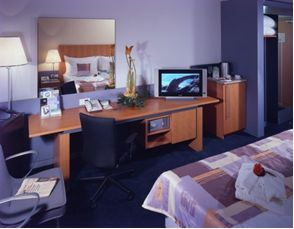 251 modern rooms offer comfortable accommodation. There are smoking and nonsmoking rooms, a unique security system, anti-allergic quilts and pillows, individual air-conditioning control system, smoke detector and internet connection. You can enjoy modern Czech and international cuisine in fully air-conditioned restaurant. It is possible to relax during Thai Massage, in mini gym and fitness centre (pool, sauna, whirlpool bath and gym). There is Wi-Fi internet connection in public areas. Secretarial services and free concierge services are also available (ensuring tickets for cultural and social events, sightseeing tours of Prague and other interesting places in the Czech Republic). Hotel is located only two stops from the city centre by metro, uniquely located adjacent to the Prague Congress Centre, in a quiet vicinity of the national heritage site Vysehrad. 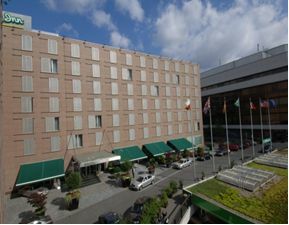 Holiday Inn PCC is located next to the Prague Congress Centre (1 minute walk).